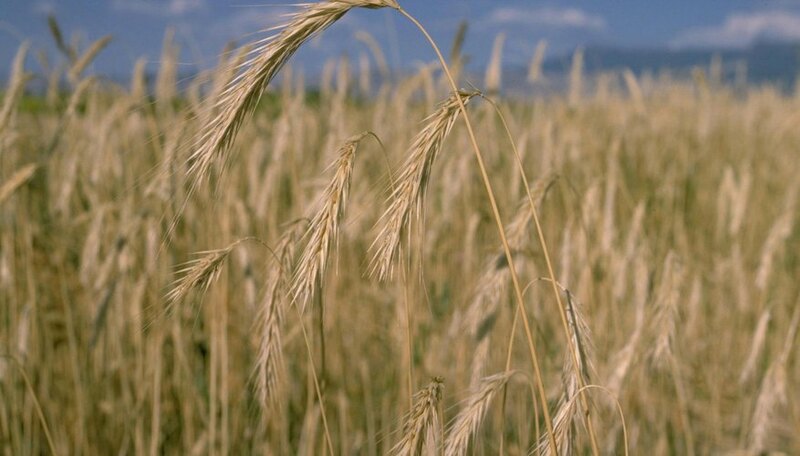 Cereal rye is a grass that looks similar to wheat and is bluish-green in color. It has flat leaves with dense flower spikes, and it grows abundantly all across North America. Each spike yields many seeds—as many as 18,000 seeds per pound of the grass. Cereal rye is easy to grow and can live in soil with a pH ranging from 4.8 to 8.0. It makes an excellent ground cover during winter months, as it tolerates drought and cold temperatures--but it thrives in warmer, well-drained soil. It is often used to feed livestock, but it is said to produce an "off" flavor in cow's milk. Test the soil's pH, looking for an ideal 5.0 to 7.0. Cereal rye can tolerate other pH levels, but if you want the grass to thrive, try to get it within that range. There is usually no need to alter the soil or fertilize it before you seed because cereal rye is a hearty grass that is easy to grow. Seed approximately 1 to 2 bushels of seed per acre if the seed is packed in. If the seed is tilled loosely, use 1.5 to 3 bushels per acre of land. This averages out to approximately 90 pounds of seed per acre. You may use more seed if you are using the grass as land cover and the area has a high probability for erosion. Do not plant your seed deeper than 2 inches. Cereal rye will grow better if planted in shallow soil. Apply nitrogen fertilizer or a manure mulch if your rye is not growing well. Cereal rye responds well to fertilizers that are high in nitrogen. Follow the directions on the fertilizer bag—you will not have to add very much. You can even cut the indicated amounts in half. Rye is usually planted after corn and other crops have been harvested, and when this occurs there is usually little need for fertilizer at all. Mow the rye when it has reached maturity. It is mature when you can see the full seeds on the ends of the leaves. Either use a mower or a harvester to cut the rye down, allow it to dry completely in the field, then bale it with baling equipment. Cereal rye is usually sold to be used as mulch or feed.